Located 23km east of Melbourne’s CBD, Ringwood is beginning to fulfil its potential as a state government-designated development area. Considered fringe suburbia until 15 years ago, Ringwood has enjoyed a substantial growth in recent years, with Urban.com.au currently tracking 19 projects at various stages of their respective life cycles within the Ringwood Metropolitan Activity Centre, reinforcing its status as a burgeoning satellite city. With a population of 17,471* and rising, a range of factors have contributed to Ringwood becoming a key property hot spot with investment from both the private and public sectors. The major catalysts has been the $66 million redevelopment of Ringwood Station and the $665 million expansion of Eastland Shopping Centre, which also included a Sage Hotel - the first to be developed above a shopping centre in Melbourne. Additionally, as Melbourne seeks to decentralise into a series of 20 minute neighbourhoods, Ringwood is capitalising on its proximity to schools, freeways, public transport and major shopping destinations such as Eastland. More recently hotel operator IHG announced it had signed an agreement to operate a Holiday Inn-branded mixed-use development, signalling its confidence in Ringwood. The development will feature 82 apartments and a 164-room hotel offering all day dining and bar, conference and meeting facilities, a gym and a swimming pool, along with on-site parking. 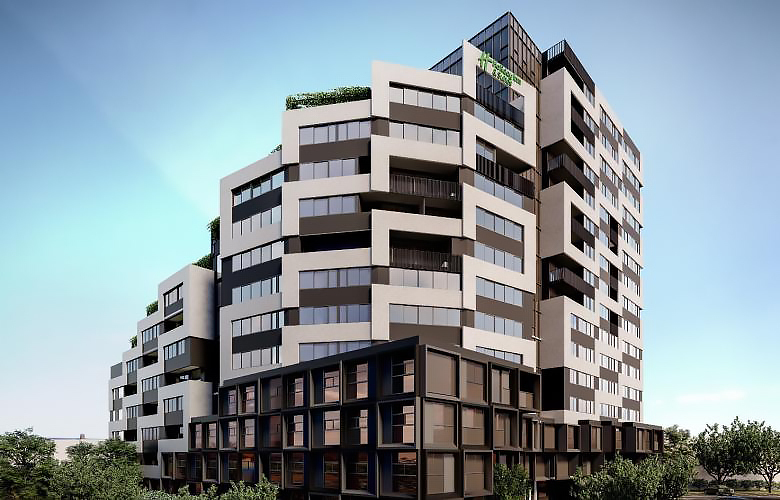 Opening in 2020, the Holiday Inn & Suites Melbourne Ringwood is being developed by Ninety Four Feet and Omni Property Group who recently signed Hamilton Marino to build the CHT Architects-designed complex. Developer OzProperty has also found recent success with its Highwood residential development designed by DKO Architecture, which delivered record-breaking capital appreciation for Ringwood on a challenging site. Completed in late 2017, the master planned development comprises 36 town houses,with an emphasis on maximising light to interiors and providing a variety of architectural typologies along the streetscape. DKO has designed Highwood with a range of streetscape typologies to reflect families who make up a large proportion of the local area. It is no surprise that one of the homes at Highwood has broken the record for capital appreciation because Ringwood is an exciting area for everyday people who are looking to get onto the property market. It’s one of several government identified growth zones, where infrastructure and industry will be leveraged for capital growth. Purchasers Lu Dongyan & Duan Hongbo purchased Highwood’s Lot 26 off the plan in 2015 for $549,000 and settled the property on 6th November 2017. They decided to sell their home a few months later in April 2018 for $702,500. They making a profit of $153,500 in 5 months. Highwood has demonstrated that demand for highly considered, architecturally designed medium density homes with multiple typologies, and close to amenity and transport are still highly sought after. The overall Melbourne market is generally challenging, however areas such as Ringwood are still maintaining strong interest from buyers. The primary reason is the recent infrastructure and private development spending has now been delivered, making Ringwood a great place to be, but another part of the story is price attainability and affordability. You can still get a 4 BR townhouse, suitable for a family, under $1m. We’re all aware the challenge in the current market is the limited liquidity and credit due to the main banks’ lending policy changes, so affordability is critical. Ringwood was a suburb in transition. 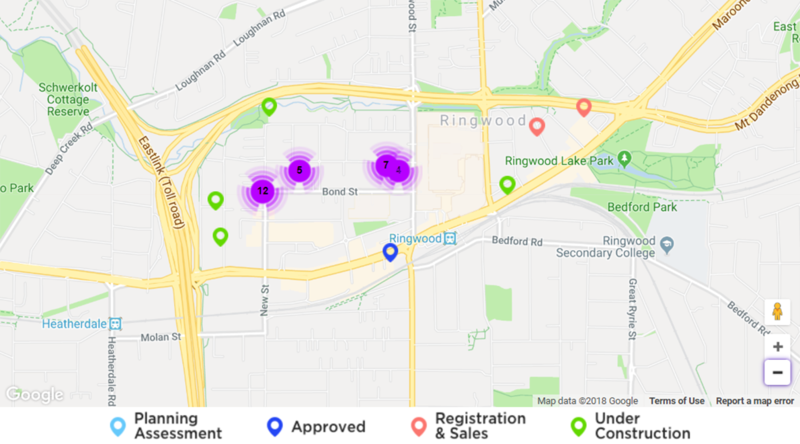 The central Ringwood area was earmarked for over $1b in developments including the Eastland expansion, new Costco, Ringwood train station upgrade and a series of mixed use developments. Furthermore, the supply of large parcels of land was limited, so we had a unique opportunity to offer a high quality medium density solution in the backdrop of all the other higher density development activity. With most of the infrastructure and developments now complete, Ringwood today offers a much higher level of liveability than other suburbs. It’s surprisingly walkable and the green, leafy outlook is just wonderful. Established in 2007, Oz Property Group is focused on delivering sustainable, considered developments around key activity zones in response to a rapidly evolving and growing Melbourne market.